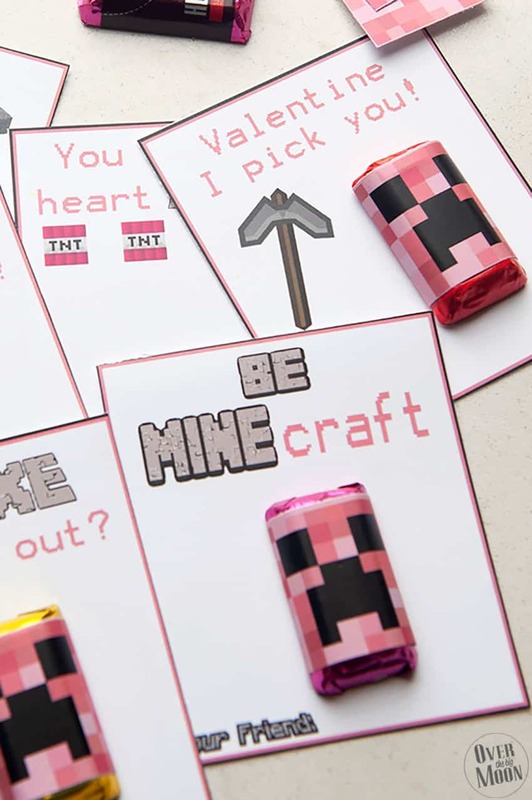 These fun Minecraft Valentine’s are perfect for those Minecraft lovers out there! 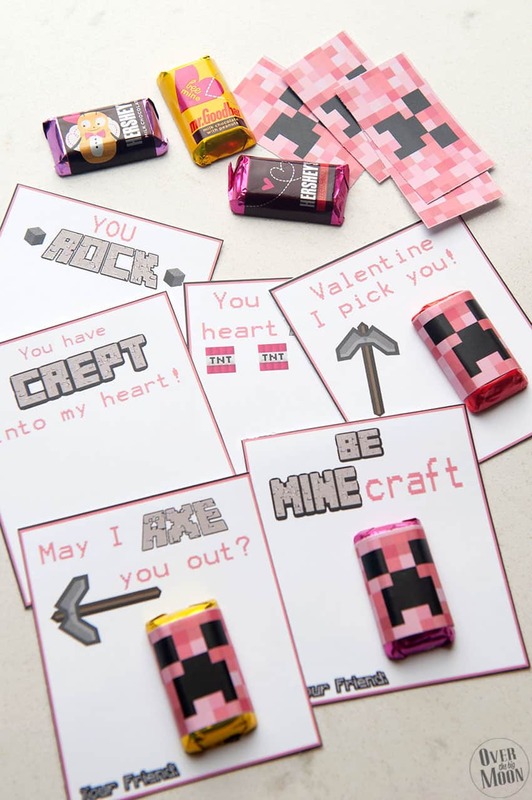 They pair perfect with our Green Minecraft Printable Valentine’s! Just download, attach a small candy and you’re good to go! The Minecraft obsession is real! And it’s been here for MANY years! There are seriously so many fun and clever sayings that go with the game. I originally made these Green Minecraft Valentine’s and immediately started getting requests for pink ones for girls out there! I love so much that girls love gaming as much as boys! So, in honor of those super cool girls I made a whole new set of sayings and this time I did them pink! I love the idea of even printing off both sets and handing out a little of both! Print the 2 downloads on your home printer using cardstock! Use the paper cutter to cut out the Valentine’s and mini candy bar wrappers. Use tape to secure the mini candy bar wrapper on the mini candy bars! 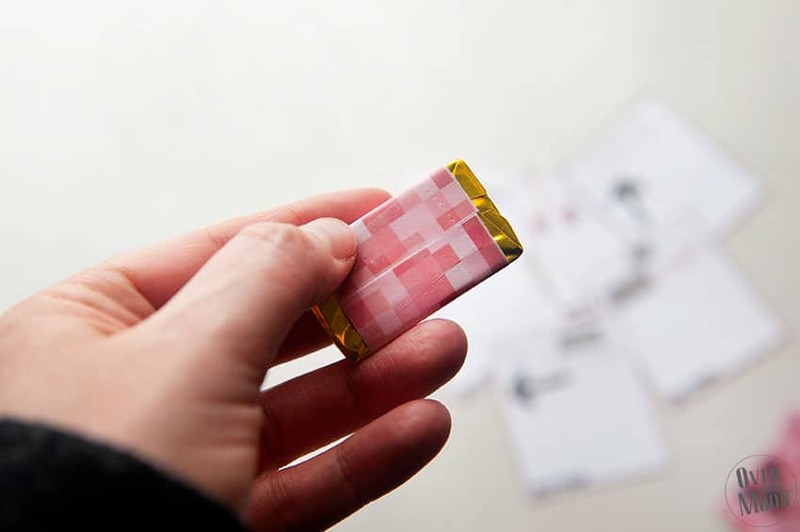 Then tape the mini candy bar to the Minecraft Valentine! 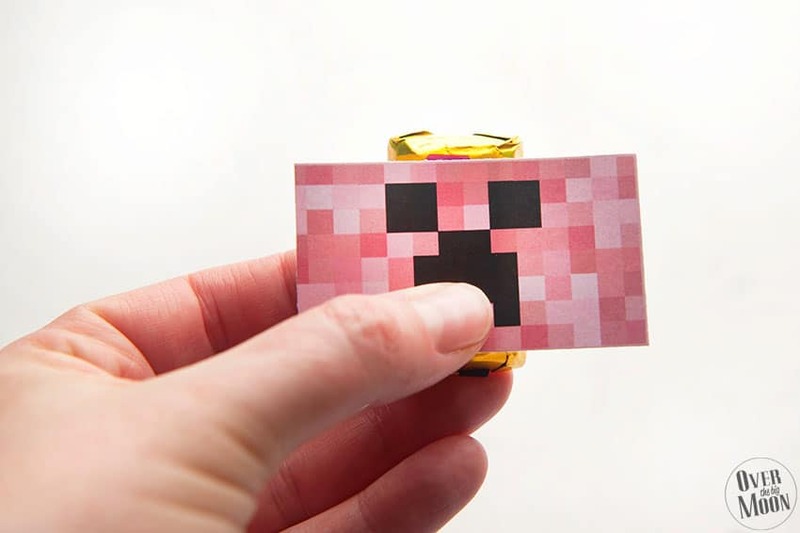 You can download both the Creeper Candy Wrappers in pink and the new Valentine cards below! 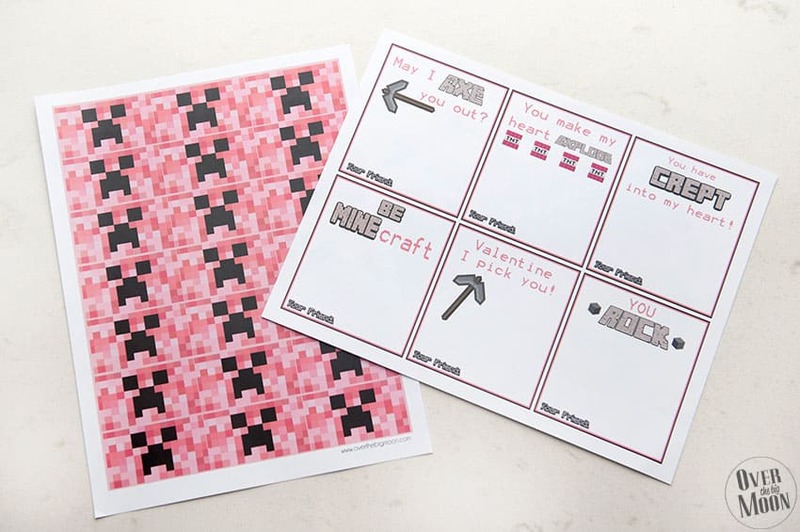 Download the Pink Minecraft Valentine’s Here! Download the Pink Creeper Wrappers Here! Make sure and check out our other printable Valentine’s and Valentine’s activities! thank you so much! I’m doing the green for a creeper and the pink for a pig! he luvs luvs luvs these – he cant wait to hand them out! Thank you so much for posting these valentines! Both my kids love Minecraft! Thank you for these! My kids were ecstatic when I showed them what we were doing for Valentine’s this year!! thank you so much for these!! 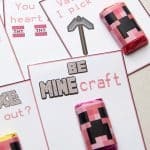 My almost 8yo was so excited when I told him id found Minecraft valentines!! YOU ROCK!! THANK YOU!! My kids love them. All 3 are using them for their classes. Wonderful idea thanks so much for sharing!! Where is the green template, there is only a download available for the pink minecraft valentines..
It’s linked several times within the post! You can either click the big picture at the bottom of the post or click here! So glad you like them! my kids LOVE these!! There are definitely going to be this years Valentine!! Thank you!! I would love to have JPG version of the green valentines. The green wrappers have a link. the valentines with JPG are pink not grenn. Only ones with JPG are pink. You have to click one of the links within the post to go to the Green Minecraft Valentines. In that post there are the links for all the downloads you are looking for. Click here to go to that post! Thanks so much! Hello I can get the green ones to print but not the pink ones. They won’t save the same way as the others. Thanks so much these are so awesome!! Thank you soooooo much! 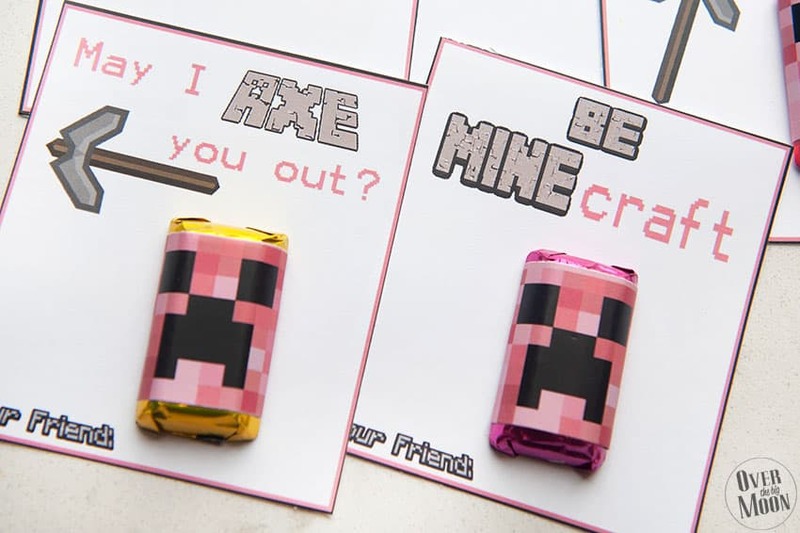 My daughter was desperate for Minecraft Valentines this year.. I’m so happy I found these.. and free even! Thank you, thank you, THANK YOU! These are so awesome! My daughter is going to love the pink ones and my boys the green ones! Thanks so much! The .jpeg for the Pink one is not working. Can you fix or email? Thank you so much! Love your work! Can you make these sayings in the green?!? Love this! These are stinking awesome!!! I’m definitely using these for my daughter this year.